All you need is three ingredients to create these pancakes, which are made from biscuit mix. They offer all the great tastes of biscuits and pancakes in one delightful creation. These biscuit mix pancakes will revitalize your breakfasts and brunches with big flavor and pancake appeal. Biscuit mix is commonly added to pancakes to boost the fluffiness of the pancakes. The biscuit mix also gives the pancakes a savory taste. Best of all, you can add other flavors to your pancakes for even more deliciousness. Mash in some bananas, apples, pumpkin puree, or blueberries, or add some chocolate chips in. Syrup can also be flavored if you want something unexpected. Top these biscuit pancakes with fruit, such as strawberries or blueberries.There are plenty of ways to liven up your pancakes, but sometimes enjoying them plain with some maple syrup is the best way to enjoy the taste of the actual pancake. When serving the pancakes, you can also make them healthier by substituting the sweetener in the syrup. Some people add in agave nectar or honey, for example. Or you can top the pancakes with plain agave nectar or honey. Other pancake syrup substitutes include applesauce, peanut butter, almond butter, butter, or Nutella. In a large bowl, combine all of the ingredients. Heat a griddle or frying pan. 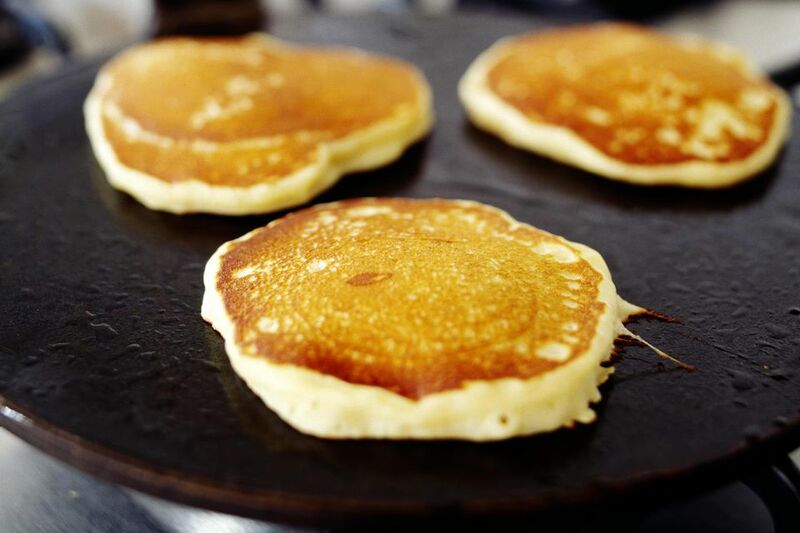 Use a quarter cup measuring cup to pour the batter and form each pancake in the pan. You can also pour directly from the bowl or use an ice cream scooper to distribute the batter. Bake the pancakes until bubbles appear in the batter and the edges of the pancakes are brown. Once they bubble towards the middle, flip the pancakes and cook for a minute or so longer. What Kind of Biscuit Mix Is It? In areas such as England, a biscuit can refer to a small baked cookie-like food, somewhere between a cookie and cracker. The biscuit mix used in this recipe is a leavened quick bread, which is often served alongside a meal and is a salty, savory flavor that is commonly topped with butter. Breakfast sandwiches are also served on biscuits, which are prepared with eggs, sausage, bacon, or cheese and other foods stuffed inside a biscuit cut in half. Is This Acai Berry Parfait a Dessert or Breakfast?